The following is an extract from the School’s official Anti-Bullying Policy – a full copy of the policy and the appendices are available from the school office. 1. 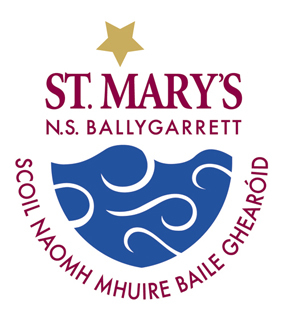 In accordance with the requirements of the Education (Welfare) Act 2000 and the Code of Behaviour guidelines issued by the NEWB, the Board of Management of St. Mary’s N.S., Ballygarrett has adopted the following anti-bullying policy within the framework of the school’s overall Code of Behaviour. This policy fully complies with the requirements of the Anti-Bullying Procedures for Primary and Post-Primary Schools which were published in September 2013. 2. The Board of Management of St. Mary’s N.S. is committed to the highest possible standard of education for all its pupils. Bullying behavior, by its very nature, undermines and dilutes the quality of education and imposes psychological damage. As such, it is an issue which must be positively and firmly addressed through a range of school based measures and strategies through which all members of the school community are enabled to act effectively in dealing with this behavior. The Board of Management recognises the very serious nature of bullying and the negative impact that it can have on the lives of pupils and is therefore fully committed to the following key principles of best practice in preventing and tackling bullying behaviour. Deliberate exclusion, malicious gossip and other forms of relational bullying, extortion, isolation, ridicule and persistent name calling. Isolated or once-off incidents of intentional negative behaviour, including a once-off offensive or hurtful text message or other private messaging, do not fall within the definition of bullying and will be dealt with, as appropriate, in accordance with the school’s code of behaviour. St. Mary’s N.S. reserves the right to take action against bullying perpetrated outside school which spills over into the school. Appendix 2: Examples of bullying behaviours. Where necessary, the Deputy DLP, Caroline Kehoe may be involved. A pupil or parent may bring a bullying concern to any teacher in the school. Individual teachers must take appropriate measures regarding reports of bullying behaviour in accordance with our school’s anti-bullying policy. Teaching the Social, Personal, Health Education curriculum (to include Walk Tall. Stay Safe, Human Rights Education, R.S.E programmes) in all classes is an effective resource which includes prevention and awareness raising measures across all aspects of bullying and involves strategies to engage pupils in addressing problems when they arise. In particular, such strategies build empathy, respect and resilience in pupils and provide pupils with opportunities to develop a positive sense of self-worth. Give pupils opportunities to talk about bullying in general e.g., Circle Time. Use of posters to stimulate discussion, involvement in poster design and display can assist in preventing bullying. Use drama or role-play about bullying. Friendship Week: Friendship week is held annually and promotes the themes of friendship, inclusion, communication and co-operation. These themes are explored on a whole-school basis. Anti-bullying behaviours and friendship skills are highlighted and discussed in class and at assembly. School councillors visit classes to play co-operative games and to discuss how to be a ‘good friend’ with their peers. School Council: School council representatives are elected in each class from 1st – 6th. The school councillors are elected to represent the views of all pupils to improve the school. Prior to School Council meetings each class has a discussion about the issues to be brought before the council. Pupils are encouraged to make suggestions for improving the school which may involve addressing any concerns they may have in relation to play, bullying and pupil relations. School Assembly: Regular reminders of the school rules and our poem on the theme of respect and inclusivity -“I’m important”. The best way to address cyber-bullying is to prevent it happening in the first place. Prevention and any awareness raising measures will focus on educating pupils on appropriate online behaviour, how to stay safe while on-line and also on developing a culture of reporting any concerns about cyber-bullying. Ask pupils to write anonymously about bullying and what should be done about it. Ask pupils to write about (or draw a plan of) areas of the school which are safe or unsafe and what should be done about this. Each class teacher will conduct an anti-bullying survey in classes 2nd -6th. This survey will take place on the third week of every term. The information gathered will be used by the teachers to help prevent bullying and identify possible situations where bullying may occur. There is a precise procedure in place for conducting the survey and dealing with pupil interviews and pupil promises thereafter. 6. The School’s procedures for investigating, follow up, recording and intervention strategies. (xviii) In cases where the relevant teacher considers that the bullying behaviour has not been adequately and appropriately addressed within 20 school days after he/she has determined that bullying behaviour has occurred, it must be recorded by the relevant teacher in the recording template at Appendix 5 (attached). * Whether any issues between the parties have been resolved as far as is practicable; * Whether the relationships between the parties have been restored as far as is practicable. Follow up meetings with the relevant parties involved should be arranged separately with a view to possibly bringing them together at a later date if the pupil who has been bullied is ready and agreeable. All recording of bullying incidents will be done in an objective and factual manner. All staff must keep a written record of any incidents witnessed by them or notified to them. These records will be noted in the yard book/discipline book and documented in a Bullying Incident Folder which will be kept in the Principal’s office. All incidents must be reported to the relevant teacher. While all reports, including anonymous reports of bullying must be investigated and dealt with by the relevant teacher, the relevant teacher must keep a written record of the reports, the actions taken and any discussions with those involved regarding the same. If it is established by the relevant teacher that bullying has occurred, the relevant teacher must keep appropriate written records which will assist his/her efforts to resolve the issues and restore, as far as practicable, the relationships of the parties involved. These records will be kept in the Bullying Incident Folder in the Principal’s office. The recording template must be retained by the relevant teacher in question and a copy maintained by the principal for the duration of a child’s enrolment within the school and for a further 3 years. It should also be noted that the timeline for recording bullying behaviour in the recording template at Appendix 5 does not in any way preclude the teacher from consulting the Principal or Deputy Principal at an earlier stage in relation to a case. It is important to note that bullying behaviour can be part of a continuum of behaviour rather than a stand-alone issue and in some cases behaviour may escalate beyond that which can be described as bullying to serious physical or sexual assault or harassment. The school will refer to relevant external agencies and authorities where appropriate. In cases where a school has serious concerns in relation to managing the behaviour of a pupil, the advice of the National Education Psychological Service (NEPS) should be sought. In relation to bullying in schools, Children First National Guidance for the Protection and Welfare of Children 2011 (Children First) and the Child Protection Procedures for Primary Schools provide that in situations where “the incident is serious and where the behaviour is regarded as potentially abusive, the school must consult the HSE Children and Family Social Services with a view to drawing up an appropriate response, such as a management plan”. Serious instances of bullying behaviour should, in accordance with the Children First and the Child Protection Procedures for Primary Schools, be referred to the HSE Children and Family Services and/or Gardaí as appropriate. The Child Protection Procedures for Primary and Post-Primary Schools also provide that where school personnel have concerns about a child but are not sure whether to report the matter to the HSE, the Designated Liaison Person must seek advice from the HSE Children and Family Social Services. Prep for interview done individual. Children brought together for approx. half an hour. Imbalance of power removed- Facilitator and pupils in room. Each side listened to- emphasis on empathy for both parties. Perpetrator discusses behaviour and reasons for behaviour. Victim has chance to express feelings. 7. The class teacher and a learning support/resource teacher will provide a programme of support for pupils who have been bullied. Such pupils may need counselling and/or opportunities to participate in activities designed to raise their self-esteem, to develop their friendship and social skills and thereby build resilience whenever this is needed. This programme of support is also part of the school’s intervention process. Pupils involved in bullying behaviour need assistance on an ongoing basis. For those with low self-esteem, opportunities will be developed to increase feelings of self-worth. The learning strategies applied within the school allow for the enhancement of the pupil’s self-worth. Pupils who engage in bullying behaviour may need counselling to help them learn other ways of meeting their needs without violating the rights of others. 10. This policy was adopted by the Board of Management on 12/02/2019.